Michele Leavitt and her husband (Unity College President Stephen Mulkey) moved into the Unity House last month and want to tell you all about it. 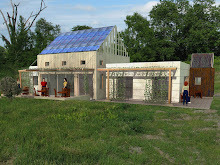 Find out what's going on at Unity's LEED Platinum, net-zero energy home at http://livinggreenatunityhouse.blogspot.com/. Even with our photovoltaic system offline for 14 days in July, the Unity House can be confidently claimed "Net Zero." We decided to do our calculations based on a year of “lived-in” data and use. Mitch’s first read date was October 5, 2008, and I recorded data on October 5, 2009. So it was a close one – the system produced 11 kwh more than it used for this time period. The PV system was offline for 14 of our most productive days this summer due to a lightning strike. At an average daily production of 18.35 kwh (6441 kwh / 351 “online” days), we can comfortably assume the system would have produced AT LEAST 256.91 kwh during that 14-day “offline” period, but very likely more. What will it take for people to imagine living in a house that generates its own energy? The Unity House is a living example… an exhibit, in fact, of self-generation in an unlikely climate. Seeing the energy system in action presents the possibility in a palpable way to visitors. I remember wandering through the Epcot Center at Disneyland with my children back in the Eighties. We walked through a 1950’s retrospective exhibit full of flashy appliances and gadgets that suggested a new way of living in comfort, leisure and convenience. Richly appointed tableaus of 50’s living spaces, designed by GE, fueled consumer dreams of an electric wonderland. All we needed was the power to turn them on and that was fully available, cheap and abundant with the flip of a switch. Disney was really on to something. Visitors left craving the new vision and ignoring the cost. Electricity was a gift that we shouldn’t question. Adults hungrily dreamed of the living room with a wall-sized TV. Homemakers mightily desired the ‘micro-wave’ that would cook a full meal in minutes and a washing machine that could do loads of laundry in a few hours. Where would the energy come from to power this world? We honestly didn’t care. Was there a cost to this lifestyle? If so, it was cleverly hidden from view. Our new sustainable house is an exhibit of a different vision for the future. We hope that visitors who experience this new tableau will feel the same level of desire for a sustainable way of living on the planet. We are awakening from the 'blind-faith' paradigm to realize the enormous actual cost of that seductive Epcot vision. The real story behind the power grid now haunts us with realities of global warming and climate change. Knowing where energy comes from and how it is produced is a priority for homeowners and consumers. Tours of the Unity House focus on growing the awareness and the accompanying responsibility for being more active participants in how we live. We are very aware of our energy source. The house is proof that one can harness the energy of the sun and, without fossil fuels, support a high-tech, comfortable and convenient lifestyle. Inviting people to witness the workings of the house gives them an opportunity to touch, feel and interact with a solar-based energy system – making the new vision tangible and real. Last week, we received a thrilling email from the US Green Building Council that our new residence, The Unity House, received the highest rating as an energy efficient, zero carbon dwelling. LEED Platinum is a significant accomplishment for Unity College. The Unity House is one of 200+ residences nationwide rated LEED Platinum. (LEED stands for Leadership in Energy and Environmental Design) We have one of four Platinum-rated buildings in Maine. We are the first college President’s residence in the country to be rated Platinum. We are proud of this accomplishment. This outstanding rating will draw national attention to Unity’s sustainability efforts. I’m sitting in the Unity House on a sunny day in February, listening to the whir of the solar inverter as the sun shines down on the photovoltaic array. It feels good to be producing so much energy on a day when the wind is blowing at 20+ mph and the thermometer reading -5 degrees F. The cement floor is absorbing sun as well, helping to warm the air to a toasty 70 degrees by noon. The heat pump hasn’t clicked on since 7am. As conscious as we are of the high performance aspects of this building, the actual comfort and efficiency never cease to amaze me. This house is a masterpiece of intentional integration…the ways in which each part supports the other is the secret to its success. My favorite thing about the house is having visitors come into the space for the first time. One of the Unity professors just brought her Environmental Citizen classes over for an introductory tour. 26 young minds opened to the concept of living comfortably in a sustainable house. Their initial reservations about ‘sacrifice and rationing’ shifted to embrace the benefits of the passive and active solar gain, the warm wood-paneled (100% recycled) interior, the ‘secret-life’ of the high-performance elements, life-cycle innovations of material use and the aesthetics. Planting ideas in this new generation of leaders will lead the way to a greener future. Some students dropped to the floor to touch the cement and wonder at its warmth – assuming that cement will be cold in winter. They shake their heads at the use of Advantech (oriented strand board made from ‘junk’ wood) as paneling in the living room, which is usually is hidden from view in attics or used as sub-flooring. In this house, it is sanded and oiled to look like marbleized wood. The black kitchen counters draw attention for their elegance, hiding the fact that ‘paper-stone’ is 100% post-consumer recycled paper. There are many surprises in this house that all add up to a wonderful aesthetic. Living in the Green House is all about opening minds to new ways of using materials – living virtuously and frugally while in great comfort! The mechanical room grabbed the interest of many as they investigated the solar inverter and the solar hot water heater. At first hesitant to wander around ‘the home of the president’, the students were soon exploring each aspect with vigor and amazement. We increased our prospects for Platinum LEED certification with our willingness to open the house for educational events. Each element of the house is designed to engage educational inquiry and the students actively engaged and asked excellent questions – leaving with a very different sense of how we might all live in a ‘green’ house. Living in the Green House is all about opening minds to new ways of using materials, producing energy and living lightly on the planet – in great comfort! -15F But Now We're Really Counting! The exceptionally cold winter continues. But there have been quite a few brilliantly sunny days and that allows for considerable solar gain for the passive design of the Unity House. We had a retreat here on Saturday morning for the Faculty Planning Committee of Unity College. We're undergoing a thoughtful and wonderful process of revising our curriculum to meet the needs of a new generation of sustainability leadership. Mick Womersley, Associate Professor of Human Ecology, and generalist on all things related to ecological economics, energy and sustainability, was a participant. Before our discussions started, Mick was roaming around the house with a temperature gun, checking out the floors, windows, and walls. When I first saw him pull the thing from his pocket, I wasn't sure exactly what he was doing. Indeed, he looked like some kind of sustainability ghost-buster! Maybe that's an emerging career in this field. Anyway, he told me what he was doing, handed me the thermometer gun, and I started flashing it as well, delighted in the simple pleasure of attaching numbers to walls and windows. Mick offered to lend me the instrument (Unity College has several of them). I took up his offer and spent Sunday (another icy cold, but clear day) taking readings throughout the day at approximately two hour intervals. Here's what I recorded. At 9 AM the temperature outside was -9 Farenheit. The south facing window, just catching a few rays of morning sun was 73 F and the north facing window at our back entrance was 43. I placed a chair in front of the south facing window. The upholstery was 89F (a nice place to get some heat on your back in the morning) whereas the other couches were 64F. I checked out the floor throughout the house and it ranged from 56-64F. The walls were 63-66. The room temperature was 63, our default setting. The Hallowell heat pump was off although it had been on earlier in the morning. Incidentally, it would not come on again until 10 PM as the house absorbed and contained so much heat during the day. Here are the remaining readings. By the way, the cold floor spot is the only place in the house that receives no sun. For most of the day, the floor temperature is the same as room temperature, but much warmer in the sunny spots as the house accumulates sun. (4) The furniture temperature reflects room temperature, but absorbs heat when in direct sunlight. What we should do next is trace the power needs throughout the course of the day. More importantly, interacting with the house in this way helps us better understand the performance of the house. Yet there's something very important that's missing here. What is the relationship between how the Unity House uses power and the regional/national grid? I'm delighted to see that Thomas Friedman's excellent new book, Hot, Flat and Crowded is a national best seller. It's an insightful and accessible plea for a comprhensive national strategy for energy innovation as a means for America to regain its leadership in the global economy. Friedman also understands the challenge of biodiversity and climate change and he provides brilliant solutions-based, practical, and wide-ranging policy suggestions. I was so impressed with the book that I gave copies to every Unity College Board of Trustee and I'm using it in a seminar I'm teaching on Environmental Security. Back to the temperature gun and the necessity of measuring power input and output as well. Friedman describes how America needs an "Energy Internet" which will allow comprehensive monitoring of energy usage. This will not only allow us to conserve unprecedented amounts of energy, but it will allow the consumer to take part in a community/cooperative venture that brings energy usage to the most specific and tangible consumer level. We thought about wiring the Unity House accordingly, but the cost was prohibitive, and we decided that we'd rather invest in ecological landscaping and other features. However, the technology should be available for every American homeowner to have utility-provided "black boxes" not unlike your cable or satellite TV setup that are connected to both your computer and the national grid. The whole point of the Unity House (and other sustainable energy projects) is to live experimentally, live with more energy awareness, and to take educational leadership to promote sustainable alternatives. As we learn more about the Unity House, we will take on some of these initiatives. we'll look for inexpensive energy monitoring alternatives, and we'll report on what we're learning. We'll continue to pursue what one reporter described as "obsessive transparency." 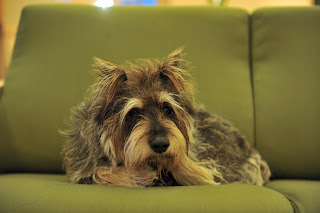 Oh, and as you can see, our dog Paco really likes sitting on a warm couch on an icy cold winter day! We've lived in Northern New England for the last thirty years, mainly in Dublin, New Hampshire, in the shadow of Mount Monadnock. Our small house in the hills (which we still use and own) is perched on the side of a hill so we never experienced incredibly frigid temperatures. It would be ten or twenty below in Keene (a Pleistocene lake bed), but at our house the temperature would be at least ten or fifteen degrees warmer. Indeed, the coldest temperature we ever recorded from 1979-2006 was about ten below zero, and the number of evenings below zero (in total over all those years) was surely less than twenty. The last few days all of Northern New England has experienced some of the lowest temperatures I've ever seen. This morning at 9 AM it was -15. I went out snowshoeing for twenty minutes just to say that I experienced that temperature. I really enjoy extraordinary weather, as long as its short-lived. But more to the point, how are things at the Unity House? Usually if the temperature is that cold it's because there's enough radiational cooling for the heat to escape into the atmosphere. We've experienced three consecutive frigid, but largely cloud-free days. By 9AM the solar gain is sufficient in The Unity House that the electric heat pump will not be needed again until about 8 PM. Yesterday it was a balmy seventy degrees. There is no draft of any kind as the house is so well insulated. Hence on brilliantly sunny days (even when the temperature doesn't rise above 5 Degrees Farenheit, there is no need for electric heat until well into evening. Also, the solar panels are generating about 4500 Watts of power. I can safely say that when the sun is shining in the middle of winter, the Unity House is carbon neutral. Still, we have slipped behind on our scorecard. As of yesterday, we have drawn more energy from the grid than we've generated, but not by much. I fully expect that as the days get longer and warmer we will redress the balance and wind up way ahead. It's time to leave the computer, head over to the chair by the window, and soak up some of that mid-Winter sun as I gaze over the frigid landscape. The Unity House is facing it's first major challenge—the depths of winter! Over the last three weeks, we've had about three days of sunshine, a 20 inch snow storm (with 40 mile per hour winds), an ice storm, snow showers, sub-zero cold, and the shortest days of the year. For the first time since we've moved in, we have used more electricity from the grid then we've generated from the solar panels. We expected this would happen. Remember that zero-carbon is our year-round total. Based on our observations thus far I think we'll easily come out ahead with our annual carbon accounting. On the few brilliantly sunny days we've had, even when the temperature never climbed above 15 degrees Farenheit outside, passive solar gain heated the house to about 68 degrees F and we didn't use the electric heat pump at all. The house kept the heat well and it dropped to 63 degrees F just as we were about to go to sleep. On those sunny days, we generated as much electricity as we used. So the challenge is to get through the clouds and snow. Even on the day of the almost-blizzard, the house is so tight that we never felt any drafts. That's our report from the first few weeks of solstice winter.